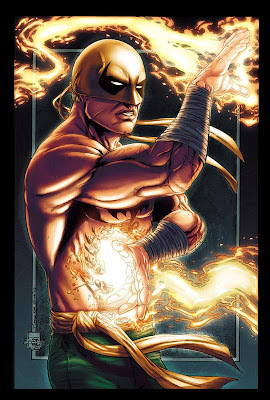 Iron Fist (Daniel "Danny" Rand-K'ai) is a fictional Character, a comic book superhero in the Marvel Comics Universe, and a practitioner of martial arts. 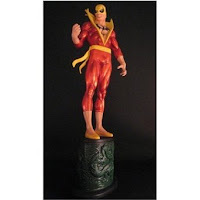 Created by Roy Thomas and Gil Kane, he first appeared in Marvel Premiere (May 1974). 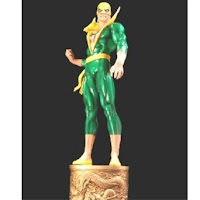 The character starred in his own solo series in the 1970s, and shared the title Power Man and Iron Fist for several years...more about Iron Fist Character Review - Keep reading !! 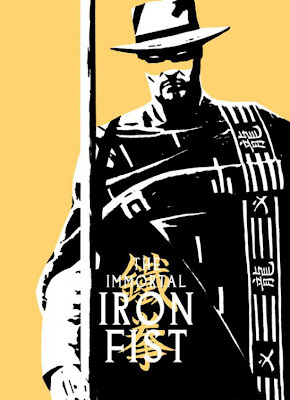 In 2006, Marvel launched a new ongoing series, The Immortal Iron Fist, co-written by Ed Brubaker and Matt Fraction and featuring art by Spanish illustrator David Aja. 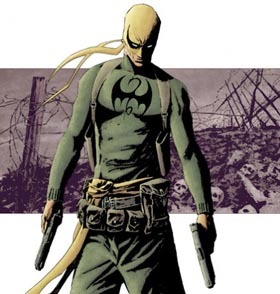 "The Immortal Iron Fist" began with a six-part arc, counter-intuitively titled "The Last Iron Fist Story". 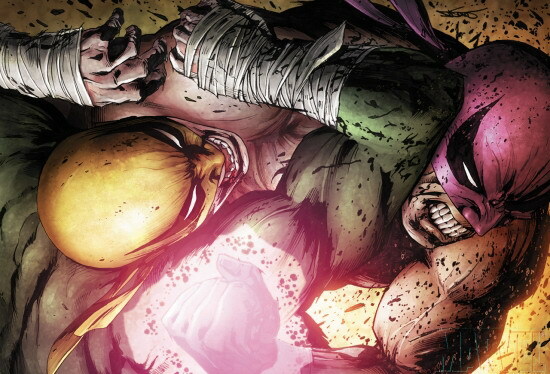 The story reveals the Iron Fist to be a legacy power conferred on the champion of K'un Lun roughly once a generation. There have been sixty-six Iron Fists. K'un L'un is also revealed as one of the Seven Cities of Heaven, each of which has an analogous champion Warrior. The story introduces Orson Randall, Daniel Rand's immediate predecessor, who reneged on his responsibilities to K'un L'un after suffering immense psychological trauma during the First World War. Randall is discovered in Thailand, apparently preserved by the spirit of Shou-Lao and in full possession of his powers, but living in drug-soaked seclusion. Randall is pursued by agents of the Steel Serpent and the terrorist group HYDRA. Jolted out of his decades-long ennui, Randall seeks out Daniel Rand in New York and gives him The Book of the Iron Fist, a sacred ledger supposedly containing all the Kung-fu secrets of previous Iron Fists, which Randall claims will be necessary if Rand is to compete successfully in the coming tournament of the Seven Champions. The Steel Serpent, whose powers have been greatly augmented by Crane Mother, quickly dispatches Randall in single combat. On the brink of death, Randall surrenders his Chi to Rand, giving him sufficient power to battle the Serpent to a standstill. After the battle, Rand is immediately summoned by his master, Lei Kung (who is also the father of Steel Serpent) to compete in a tournament that will decide the cycle according to which each of the Seven Cities of Heaven appears on Earth. However, the leaders of the Seven Cities had secretly erected gateways between Earth and each city without the knowledge of the populace. The corruption of the leaders of the Seven Cities of Heaven has spurred Iron Fist, his master Lei Kung the Thunderer, Orson Randall's daughter, and John Aman to secretly plan a revolution. Iron Fist discovers that Crane Mother, and Xao, a high-ranking HYDRA operative, are planning to destroy K'un Lun by using a portal. Upon learning of the plot Steel Serpent helps Rand and the other Immortal weapons to defeat Xao. Rand destroys the train intended to destroy K'un Lun by extending his chi to find the train's electromagnetic field, transforming himself into "a human bullet." Meanwhile, the revolution orchestrated by Lei Kung and Orson's daughter proves successful, with Nu-an, the Yu-Ti of K'un Lun fleeing in terror. When Rand confronts Xao, Xao reveals that there is an eighth city of Heaven before killing himself. Steel Serpent ultimately seeks to redeem himself to his father and to the populace. Rand suggests Lei Kung as the new Yu-Ti, with Orson's unnamed daughter as the new Thunderer. After the events, and learning that the Randall fortune that started Rand International was formed from the oppression of the Cities of Heaven, Rand decides to transform the company into a non-profit organization, dedicated to helping the poor. He also sets up the Thunder Dojo in Harlem to help inner city children, buys back the old Heroes for Hire building as the new Rand International Headquarters, and his new home, while offering Luke Cage a position at the company. He also tries to reconnect with Misty Knight. Rand (on his 33rd birthday) soon learns a disturbing fact about the previous Iron Fists: every single one has died at the age of 33, except Orson Randell, who vanished at that same time. Soon afterward Rand is attacked by a servant of Ch'l-Lin, defeating Rand easily. He claims that he has killed many Iron Fists. However, Luke, Misty, and Coleen arrive just as the servant prepares to slay Rand. Luke manages to get hold of the mysterious assassin, but he then suddenly vanishes. Rand searches for answers in the Book of the Iron Fist to try to understand how Orson Randall was able to avoid being slain by the Ch'l-Lin's assassin. However, one of Rand's new business associates calls Rand up to alert him of the Ch'l-Lin assassin staking out the Thunder Dojo. Rand heads for the dojo, where he finds the assassin, whose real name has been revealed as Zhou Cheng. Cheng has placed some sort of telepathic command upon the students to kill each other if Rand does not surrender. Rand bows before him, but this is quickly revealed to be only a ploy, as Luke, Misty, and the other Immortal weapons arrive to aid Rand. While still formidable in combat, Rand correctly guessed that an opponent who was tailored to fight the Iron Fist would not be as effective against the other weapons. The group defeats Cheng, but he vanishes into thin air. The Immortal weapons embark on a hunt for Cheng, while Rand attempts to learn about his new adversary. He soon learns that Orson Randall was only able to escape Cheng by addicting himself to heroin, thus damping his chi and leaving Cheng under the assumption that he had died. While searching for a way to defeat Cheng in the Book of the Iron Fist, Rand discovers that his assistant, Nadine, is an accomplice to Cheng, after she poisons his coffee. While Rand's chi prevents the poison from killing him, it is sufficiently strong to weaken him significantly. All of a sudden, Cheng arrives in Rand's office, thanks Nadine (who, although being Cheng's "beloved," appears to have been a rather reluctant accomplice), and prepares to finish what he and Rand started. Just then, Nadine steps in and attempts to stop Cheng, revealing to him that she is pregnant with his child, and does not wish for their baby to be the child of a murderer. Cheng, is it revealed, is seeking to retrieve the heart of the Iron Fist in order to enter K'un Lun and devour the egg that births the next Shou-Lao the Undying every generation, thus wiping out K'un Lun's Iron Fist legacy. Despite having slain evey previous Iron Fist who did not otherwise fall in battle or relinquish their power (excepting Orson Randall), Cheng has always failed to reach the egg. Cheng, who it is also revealed has been slowly buying out Rand Int. over the past 20 years, throws Nadine out of the way, and continues his attack. Rand has his shoulder dislocated during the battle, but manages to defeat Cheng even in his weakened state. Following the duel, the Immortal Weapons, Luke, Coleen, and Misty arrive, and reveal to Rand that they have discovered a map in Cheng's apartment that leads to the Eighth City of Heaven, whose existence was mentioned by Xao during the tournament of the seven cities. Rand and the others realize that his is where the Ch'l-Lin originated, and depart for the Eighth City. Before their departure, Davos arrives at the behest of Lei Kung to inform Rand that the Eighth city is, in fact, a prison constructed to hold demonic creatures that had once threatened K'un Lun and the other cities of Heaven and its gate only allows for passage in but not out, making it effectively synonymous with Hell. However, Davos also informs Rand that the previous Yu-Ti had housed anyone who attempted to rebel against his rule in the Eighth city, and Lei Kung commissions Rand and the Immortal Weapons to rescue the wrongful prisoners, and informs them that the in-not-out rule can be bypassed by all six of the Immortal Weapons. Upon arrival at the gates of the city, Rand and the others are literally sucked into the depths of the city, whereupon they are attacked by the prisoners of the Eighth city, which is ruled by the nefarious Changming, and forced to fight the demons of the city one by one, each time beaten nearly to death (their Chi weakened by having been pulled into the city) and rotated repeatedly, while being allowed to heal just enough to be able to fight again. While Rand is in his cell after a fight, he hears a tapping on his cell wall, and realizes it is being done in Chinese, with the message "You are an Iron Fist. Just like me." Meanwhile, it is revealed that Davos has not been honest with Rand and the Immortal Weapons about their mission, as he has posted a spy outside of the gate of the Eighth City, who reports there being "no signs of life," but that "something is clearly happening," and Davos determines that this requires him to battle Rand once again. Rand's fellow prisoner reveals himself to be Quan Yaozu, the very first Iron Fist. Quan reveals that in the early days of K'un Lun's history, Changming had risen to power during a time of moral decadence in the city. Changming had been the one who had originally summoned all of the demonic creatures that had once plagued K'un Lun into the city, including Shou-Lao the Undying, and used them to quickly conquer the city. One day, however, a lone warrior had entered the dragon's cave to challenge it. Before Quan can finish, he and Rand are removed from their cells and brought into the arena for a fight. By now, Changming has learned that Rand and the Immortal Weapons have been formulating a plan to rescue the prisoners of the Eighth City and make their escape, by leaving each other Morse code messages in the arena after each fight. Changming declares that Rand and Quan will fight to the death. Rand refuses to "fight an old man," but Quan, now in his Iron Fist suit, replies, "Sorry, Young Fist. I've been waiting for this chance for freedom Far Too Long." However, once the fight begins, Rand immediately senses that his opponent lacks any perceivable martial arts skills and realizes that he is not the true Quan Yaozu. As the Immortal Weapons manage to escape and defeat the guards during the fight, Changming reveals that he is, in fact, the true Quan Yaozu. He explains that he voluntarily stayed in the Eighth City to keep K'un Lun's demons from escaping. However, upon seeing his lost love thrown into the Eighth City, Quan became disillusioned, and believed that K'un Lun was not worth saving, eventually rising up to rule the Eighth City as Changming. Rand and Fat Cobra manage to defeat Quan in the battle, and prepare to ask him the true nature of the Eighth City and why they have been sent there. However, Rand soon discovers that the Immortal Weapons are pawns in a plan Quan has hatched. As the door to the Eighth City can only be opened from the inside by the Immortal Weapons, his plan was for the Immortal Weapons to make an escape attempt, thereby opening the gate and unleashing Quan and his army to take his revenge on the Seven Cities for having sentenced him and many of their citizens to an eternity in the Eighth City. Quan forces Rand to lead him out of Eighth City and back to K'un Lun, but after making it outside the gate, the two encounter Davos, who is waiting outside the gate with a sniper rifle. He tells Rand that he has been sent there by Lei-Kung to assassinate Quan, as he and Lei-Kung believe that Rand lacks the ability to take a life. In the ensuing battle, Rand manages to defeat both Davos and Quan, going as far as to take a bullet in the hand for the latter. Rand's actions impress Quan, who decides that Rand may be living proof that K'un Lun is not the corrupt city it once was. Rand and Davos agree to guide Quan to K'un Lun and arrange a meeting between him and Lei-Kung to give Quan a forum for his grievances. However, when Rand returns to New York, he finds a HYDRA cell waiting for him at Rand International, seeking retribution for the death of Xao, and holding Misty hostage. In the ensuing battle, Rand Int. is destroyed, but Rand and Misty escape unharmed. With Rand Int. destroyed and now left with only a fraction of his former net worth, Rand and Misty purchase a new condo in Harlem, and Rand decides to focus all of his attention and remaining resources at the Thunder Dojo. While moving into their new home, Rand asks Misty to marry him. Initially skeptical of the offer, thinking it may only be "one of those honor things", Misty accepts and reveals that she is pregnant with Rand's child. Plunging his fists into the molten heart of the dragon Shou-Lao the Undying infused the dragon's superhuman energy into Rand; this along with training by Lei Kung the Thunderer gave Rand the power of the Iron Fist, allowing him to summon and focus his chi (or natural energy) and enhance his natural abilities to extraordinary levels. His strength, speed, stamina, durability, agility, reflexes and senses can all be greatly intensified, making his already formidable martial arts skills even more so. The ultimate expression of this focus is the ability to concentrate his body's natural energies into his hand, manifesting as a supernatural glow around his clenched fist, making his fist "like unto a thing of iron". So concentrated, this "iron fist" can smash into its target with superhuman hardness and impact, while his hand becomes impervious to pain and injury. However, the feat of summoning the power required leaves Rand physically and mentally drained, unable to repeat the act for a time, as long as even an entire day in certain instances. Such an ability is described as "quasi-mystical". 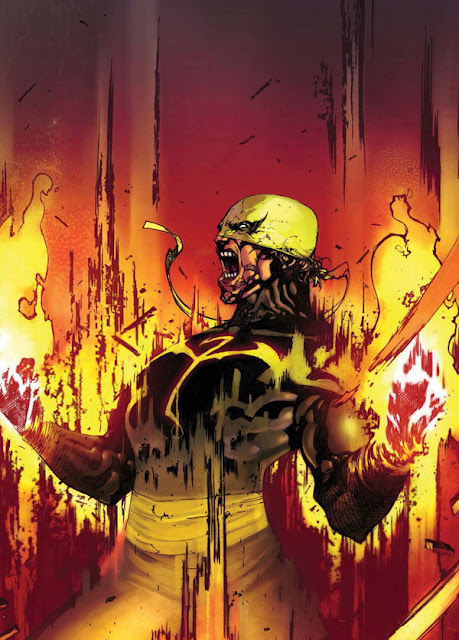 Other applications of the Iron Fist power include the ability to focus chi energy inward to heal oneself or outward to heal others of injury, as well as the ability to telepathically fuse his consciousness temporarily with another person and meld with that person's mind. In Maximum Carnage, Rand was able to use the mental application of the Iron Fist to temporarily calm a rioting mob. When asked about this by Spider-Man, Rand replied that all humans are, in essence, one divine being, in a constant craving for that oneness, and once it is offered, it cannot be refused. When asked by Spider-Man how long it would take to learn this "meditative technique", Rand replied, "Eight or ten years." 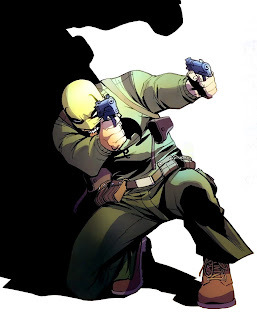 Orson Randall, Rand's predecessor as Iron Fist, demonstrated applications including hypnosis and channeling his chi energy into projectile weapons to increase their destructive capacity. Randall also showed enhanced resistance to injury, including resilience to poison gas dropped on his fellow combatants in the trenches of World War I, and a greatly slowed aging process. Although almost one hundred years old by the time he encountered Daniel Rand, he demonstrated physical vitality commensurate with a highly-trained martial artist half his age. Rand has presumably acquired powers and abilities at least equivalent to Orson Randall's—though not necessarily the skill to control them—thanks to combining Randall's chi energy with his own. He is also in possession of the Book of the Iron Fist, study of which will greatly expand his kung fu skills. Rand displayed what he had learned from Orson Randall regarding alternative applications of the Iron Fist when he was able to extend his chi from his fist into the electromagnetic field of the train intended to destroy K'un Lun, transforming himself into "a human bullet." Despite the train being loaded down with "enough raw explosives to make Hiroshima look like a sparkler", Rand was able to destroy the train, and survive the massive explosion virtually unharmed. In combat with other superhumans, he has demonstrated the ability to strike Skaar - the son of the Hulk and Caiera the Oldstrong - with enough force to at least daze Skaar, despite the latter having inherited his father's strength, later destroying Ragnarok (cyborg clone) - an android clone of Thor - with Spider-Man throwing him at Ragnarok. Even without the Iron Fist, Rand is a master of all of K'un Lun's martial arts and many of Earth's. In a confrontation with Tony Stark, it is revealed that Iron Fist has been registered as a lethal weapon, as is supposedly required of advanced martial artists in the United States. His lawyer is present during the confrontation and argues the loophole that he is already registered with the government, and that his abilities are skill based and not power based, meaning that he does not technically qualify as a superhero and it is suggested that he has broken no laws. 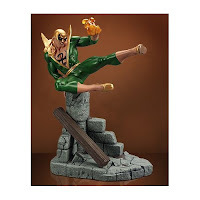 In May 2000, Marvel Studios brought Artisan Entertainment to co-finance an Iron Fist film, hiring Ray Park to star and John Turman to write the script in January 2001. Park read extensively the comics Iron Fist had appeared in. Kirk Wong signed to direct in July 2001, with filming set for late 2001/early 2002. 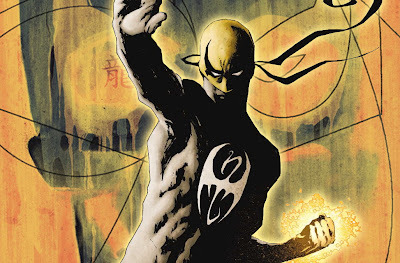 Iron Fist nearly went into pre-production in March 2002. Wong left the project in April 2002. By August 2002, pre-production had started. Filming was pushed back to late 2002, and then to late 2003. In March 2003, Marvel announced a 2004 release date. In April 2003, Steve Carr entered negotiations to direct. In November 2003, the release date was moved to 2006. In March 2007, Carr placed Iron Fist on hold due to scheduling conflicts. In 2009, Marvel announced they have begun hiring a group of writers to help come up with creative ways to launch its lesser-known properties, such as Iron Fist, along with others such as Black Panther, Cable, Doctor Strange, Nighthawk, and Vision. In August 2010, Marvel Studios hired Rich Wilkes to write the screenplay..